If you have a baby, a baby diaper bag is one of the most important baby accessories you will purchase. Choosing a great diaper bag makes a world of a difference when you go out with your baby. A proper diaper bag keeps you very organized and ensures that you always have everything that your baby might need. Many parents enjoy having a trendy diaper bag that matches their style and fashion, and with diaper bags, it is possible to get everything you want out of your diaper bag. It is crucial that you will be able to fit what you need in a diaper bag in an organized way. Make sure there are plenty of pockets inside to make it easy to find what you are looking for when you need it. Take into consideration the size you need to accommodate all the baby’s needs. For short outings, you may want a smaller diaper bag that looks more like a purse. For day outings or if you have more than one child, a larger tote diaper bag may be appropriate. Everything that you will need for the baby should fit comfortably inside the bag with enough space that you can get things out without having to unload the entire bag. Diaper bags are often made of a sturdy material that is water resistant or machine washable and will save you when you have to deal with a spilt baby bottle or other accidents. The material also contributes to the weight of the bag. Try to find a lighter bag that will not add much weight. Each diaper bag has different features, so choose one that has the features that are important to you. Some have hidden bottle pockets to make it look more like a purse, some have insulated bottle pockets to keep the bottles fresher, some have changing pads that pull directly out of the diaper bag and some have straps that attach directly onto your stroller without the use of clips. 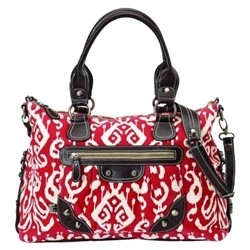 There are countless brands of diaper bags, colors and styles to choose from. Some of the more popular kind of bags used are the backpack style diaper bags, messenger bags and the tote bags. The style that is right for you is the one that you prefer most and the way you plan to carry it. Every mother’s needs are different. When looking for a diaper bag, think about what your needs are before you start looking. With the vast variety of diaper bags available, you should be able to find a bag that matches your needs. 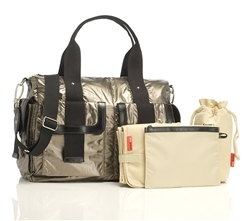 Dainty Baby carries a variety of fashionable and super functional baby diaper bags. Feel free to browse our selection of top brands like Skip Hop, Babymel, Petunia Pickle bottom, Storksak, Ju Ju Be and more. The most important thing when choosing such a bag is to pay attention to the material from which it is made and the size of your requirements. Hey hey. I had a problem with finding the best diaper bag and I tried MAAAANY. But this one here finally was the one. It has everything. Hope it helps someone out like it did me.